CARSON CITY, Nev., Jan. 15, 2015—The newly released web-based Walker Basin Hydro Mapper aims to provide real-time visualization of streamflow, and waterbody stage and volume in the Walker River Basin. The mapper provides data covering approximately 3,000 square miles of Nevada and California, from the headwaters of the Sierra Nevada Mountains to the terminus of Walker Lake, an area slightly larger than Delaware. Real-time hydrologic data are used to monitor floods and droughts, inform water supply and agricultural water-use management decisions, and monitor and track restoration efforts in the basin. A screenshot of the Walker Basin Hydro Mapper homepage shows current Walker River Basin conditions. 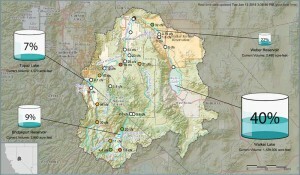 The Walker Basin Hydro Mapper uses static and interactive maps and graphs to integrate real-time streamflow, and lake and reservoir volume data from U.S. Geological Survey gages. From the homepage, users can view a snapshot of current conditions throughout the entire Walker River Basin, or use the interactive map viewer to see current and historical data focused on individual segments of the Walker River, the entire basin, or other user-defined areas. Users can also view graphs of selected streamflow, and waterbody volume and stage from USGS gages in the basin. The USGS’s Nevada and Texas Water Science Centers developed the website through a grant from the National Fish and Wildlife Foundation’s Walker Basin Restoration Program, funded through the Bureau of Reclamation’s Desert Terminal Lakes Program. 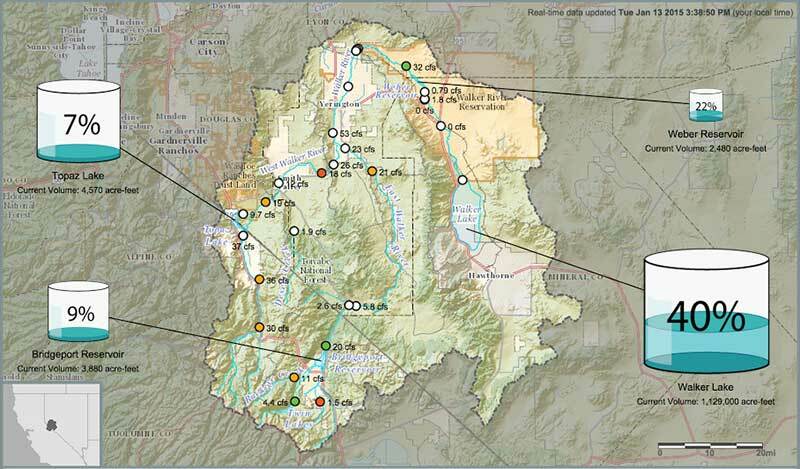 The mission of the USGS Nevada Water Science Center is to provide sound, technical, and unbiased research and monitoring of water resources in the State of Nevada, including support of the Walker Basin Restoration Program. Additional information can be obtained on theNevada Water Science Center homepage.